October is a month of celebration and sadness. Memories of the Loma Prieta earthquake and the Oakland hills firestorm are seared in our collective memory. Not as many of us remember another disaster that struck 50 years ago this month. Oakland’s “Great Columbus Day Flood” caused death and widespread destruction. In a copy of The Montclarion, saved by JoAnn Newcomb and sent to me by reader Harriet Schlader, it shows photos of flooded streets and mud-ravaged homes and businesses. The rain fell with such intensity, a Rishell Drive resident recorded 5.1 inches in 12 hours. Merchants bailed water and mud out of Raimondi’s, The Little Daisy and the Toy Chest and the ceiling caved in at the Safari shop. Sadly, a 5-year-old girl also died during the storm, as she and her mother tried to escape their Kimberlin Heights home. All this occurred on Oct. 15, 1962, and reminds us that there’s no better time than the present to review our disaster preparedness plans. OCTOBER OFFERINGS: Hitchcock would be proud. In fact, Poe would be “crowing.” The gals at The Fat Lady have done it again. They’ve turned the venerable Jack London Square restaurant into a spectacle of specters and spooks. It’s a feast for the senses — in particular, the eyeballs — since everywhere you look, something is staring at you. So serious is this annual endeavor, The Fat Lady closes for two-and-a-half days to decorate. 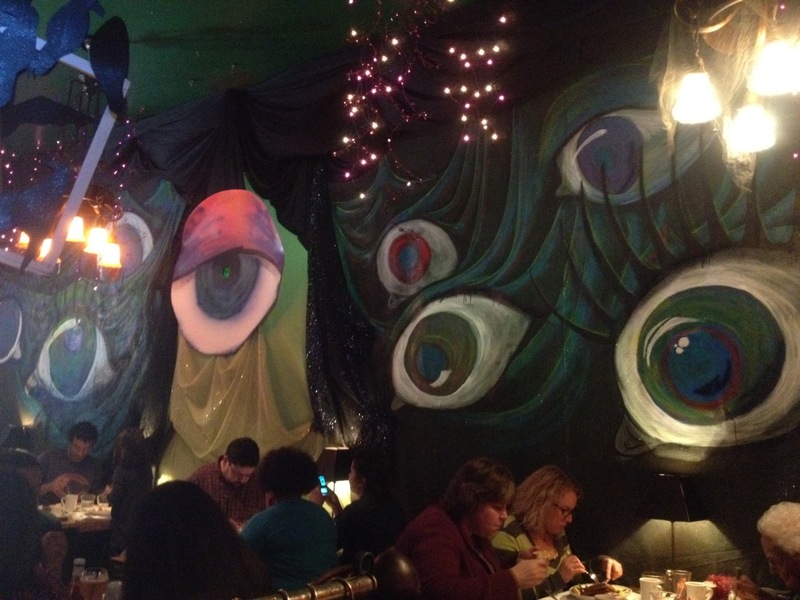 This year’s theme is a mash-up of monsters and movie tributes to “Psycho,” “The Birds” and “Spellbound.” One whole wall is awash in eyeballs a la Salvador Dali. Aside from the giant peepers staring at you from every corner, there are menacing black birds perched on every post. Crows even cover the window screens that are suspended from the ceiling. All this is enough to draw crowds, but it isn’t the only reason folks come to The Fat Lady. The food and service are extraordinary — right down to the plate of warm house-made muffins and cornbread on each table. Speaking of places that decorate for Halloween, Terrace Gifts and Coffee (on Broadway Terrace) not only has its decorations up but is now serving wine and appetizers. The Feng Shui has always been good in this place, but it’s even better with a nice glass of pinot and artisan cheeses, meats and bruschetta. October is the perfect season to sit in the canvas covered patio and feel the warmth of the waning sun. Montclair Elementary School also lost a beloved teacher this month. Rob Jue passed away at his home Oct. 6. Mimi Rohr had a story on Jue in last week’s Montclarion.